My friend Carol came from Scotland for a holiday and I was lucky enough to spend the day with her. 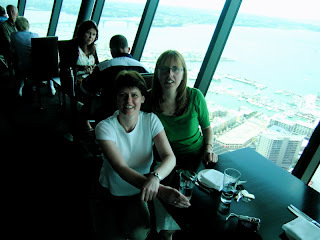 Wanting to show her Auckland as well as gas bag, lunch up the sky tower seemed like the perfect treat. We had a wonderful day, it didn't feel like 9 years since we had seen each other. Wow how time flies! Carol was then off to Hamilton and to continue with friends on a tour of the south island.